Another year, another set of trials, and of course another selection policy. As Britain’s swimmers ready themselves to spin the Russian roulette wheel in the hope of a ticket to Kazan for the World Championships, these are the criteria they will have to meet if they are going to get there. This year’s policy something of a hybrid of those that have gone before. Rather like last year’s England selection policy for the Commonwealth Games, it’s partly based on relative performances against a standard, but with much higher targets. This again, therefore, means that the team can’t be predicted with any certainty until all events have been swum. One thing is apparent though; either the GB team heading to Russia will be very small, or it will be very fast. The team will have a maximum size of 30 swimmers, to include relays, and up to six discretionary picks. Here’s how those places will be filled. Well maybe not all that easy. Winning an event certainly puts you in pole position for a spot on the team, but to be certain you need to meet the times give in Table 1 of the selection policy. These were set at the World Ranked number 6 time at the start of December last year, although a couple of December swims snuck in higher so a few times now look like they are ranked 7th in the finalised 2014 rankings. Events highlighted red have QT’s faster than the current British Record. Those times are tough. Very tough. Indeed based on performances in 2014, which was to all intents and purposes a very good year for Britain, only 5 men and 7 women made those standards – see the full analysis linked below for details – and many of the times are faster than the current British Record. So barring a step up from the squad as a whole, there should be many more places still to be filled once event winners are out of the way. For swimmers finishing second in an event, and for those who win an event but don’t make the Table 1 time, there remains a chance for selection via the alternative criteria, but this is where it gets more complicated. A second set of consideration times is provided in Table 2. These are benchmark times that British Swimming has predicted “will be competitive in Rio” and appear to be a forecast for the likely time to make the Olympic podium in 2016. That means the times are very, very quick and it’s unlikely that many, if any, swimmers will make it inside them, particularly in second place. Only Jazz Carlin in the 800m free and Siobhan-Marie O’Connor in the 200IM managed it amongst women in 2014, and Ross Murdoch in the 200m breaststroke was the sole man to do likewise. The times are also quite variable, with some events much tougher to qualify for than others in relative terms. The FINA points scores for the women’s events range from 917 to 980, and 928 to 986 for the men, the women’s 100 fly and the men’s 200 breaststroke getting the raw end of the deal in each case. And here’s where the percentages come in again, much as they did for Glasgow. Winners outside the Table 1 time and runners up in each event will be ranked against the Table 2 times based on the percentage difference to the consideration times, with the proviso that nobody more than 2% above the times will be considered for selection. This cut off point is shown below for each event. So in theory that means that the remaining places on the team can be filled by reading down the list of swimmers ranked by percentage until the team is full, but then there is another twist. The 6 relay squads will also be ranked against the consideration times, and compared directly with individuals. Hence the number of selection spots available will be a continually moving target until everything is swum. For relays the ranked time will be the sum of the four participants in the relevant individual events, but there would not appear to be any allowance for takeovers being made. The times are equally fast here, and only the all–conquering men’s medley team made any of them last year. This relay approach seems odd, given that qualification for Rio is at stake in Kazan and the policy, if applied directly as written, could lead to Britain sending a less than full complement of teams to the World Championships. It’s an area to keep an eye on as events in London unfold. The selection policy includes for the addition of 6 swimmers at the discretion of the Head Coach and National Performance Director. While decisions may be influenced by the rankings under the secondary criteria, and they could be used to make up relay squads, this isn’t a hard and fast rule and hence anyone could get a shot here. Whether this is used to give up-and-comers experience remains to be seen, but it’s a good fall back to make sure the likes of Adam Peaty, Siobhan Marie O’Connor et al (as long as they are fit) are on the plane even if they have an off day at trials. To try and illustrate how this works, we’ve taken the 2014 British Rankings and applied the selection policy to them as through they were results at trials. This shows 12 swimmers qualifying via table 1 times, across 15 events, with 5 further individual swimmers picked from the consideration times and 5 of the 6 relay teams making the cut. The cut off in percentage terms above the Table 2 times fell at about +1.75%; it will be interesting to see how that works out in London. So that’s how the GB team will take shape over 5 days of racing in London. There could be a decent sized squad heading to Russia, and if there is they will have earned their place; the team will need to be fast by default to get round the selection wheel. Banner image: Francesca Halsall, Courtesy of Arena. Fascinating analysis! Clearly the standards are set purposefully tough & I would not be surprised if it is the precursor to a similar “raising the bar” to make the Rio team. I’m not against it at all, but hope that the ‘Q-rules’ for Rio are published very early so all athletes have a clear understanding of what is required & can set their sights appropriately, & soon! It was always expected that it would be tougher to qualify for Rio than it was for London – the hierarchy have been pretty open about that. But have we gone too far? If the standard steps up again next year does that mean people would need to swim top 5 times or top 4 times, or even top 3 times? I think you can take this approach too far, but I agree everyone needs to know early. 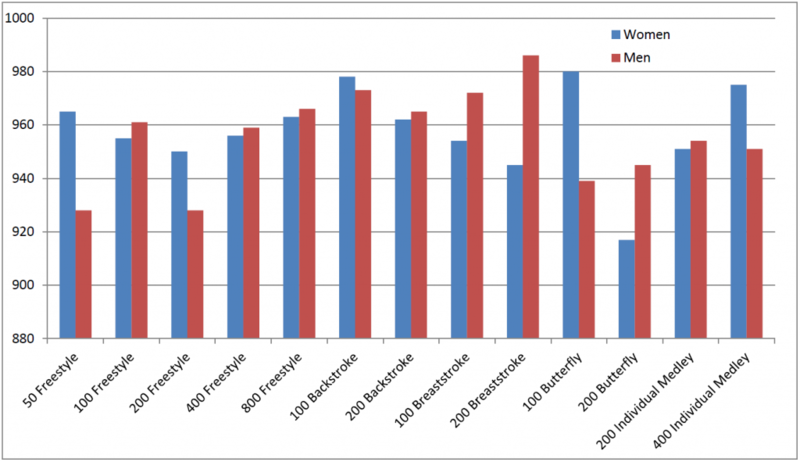 Severe, testing hurdle – fewer swimmers than expected make the grade. Then, guess what the ‘favoured’ few (who already get good funding) get the nod, snookering all the up-and-coming swimmers. Imagine if Fran, Siobhan, Adam P, or Michael J weren’t on the plane to Kazan! We ought to be using the opportunity to take a broad team, to cut their teeth in a major event before Rio. Wish British Swimming made it as clear to understand, I do wonder if Becky Adlington would have made the team if the selection policy was so tough forBejing! Some swimmers can make a significant improvement on the international stage, if given the chance as Becky showed in golds and world records, the selection policy at the moment gives the swimmers no choice but to go into full taper just to make the qualifying times, let’s hope there having a good day when they swim! Indeed a fascinating and very useful analysis. Whilst it does appear complex it would seem to be designed to give the selectors as much flexibility as possible to “have” to take only those with a genuine podium chance. Future funding will be based on medals at Rio rather than finals or semi finals so to take a smaller team of genuine medal contenders and to have the flexibility to take along a few up and coming youngsters for experience seems a sensible use of what is limited current funding to me.